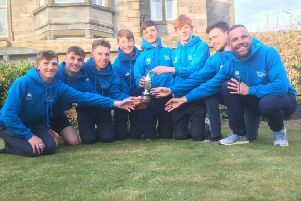 Michael Lawrie, the youngest son of 1999 Open champion Paul, coped well in blustery conditions to make a promising start in the 97th Scottish Student Championships at Moray Golf Club in Lossiemouth. In strong winds and intermittent hailstorms – one particularly fierce one forced play to be suspended in mid-morning – the Stirling scholar recovered from a double-bogey 6 at the fifth on the New Course to make birdies at the eighth, 14th and 17th. In carding a three-over-par 73, Lawrie held the clubhouse lead for a spell before his Stirling team-mate, Oliver Bailey, came in with a 72 that was illuminated by an eagle-3 at the 14th. The only disappointment for Bailey was that his splendid day’s work earned him the narrowest of leads after he dropped three shots in the final four holes. James Blyth (St Andrews) sits third on 74, a shot ahead of both Stirling’s Jordan Sundborg, winner of the recent West of Scotland Trophy event at Western Gailes, and Peter Kerr (St Andrews). In the women’s event, which got underway on the Old Course, Stirling’s Chloe Goadby covered the last 11 holes in three-under to set the pace with a one-over-par 75. That earned her a one-shot lead over her Stirling team-mate Penelope Brown, who also battled back well after finding herself four-over after just five holes.